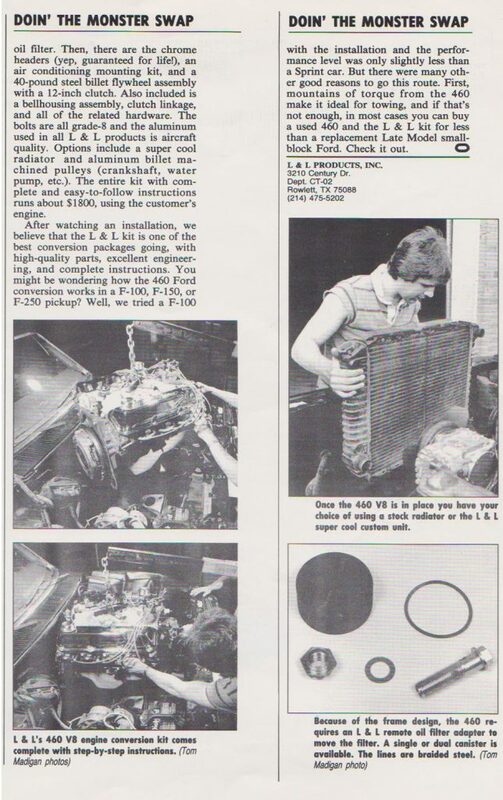 L & L Products | Specializing in converting ford broncos and ford trucks to 429 or 460 engines. 460 Motor Mounts-Solid or Rubber? A common question in regards to selecting the right 460 motor mounts for the 460 swap is whether to use solid steel or rubber mounts. Although people are often told to buy solid steel mounts, solid steel engine mounts are NOT recommended for use in daily-driver trucks. The reason for this is that solid steel engine mounts do not allow for any give or movement, resulting in cracked engine frames. While solid steel mounts can be appropriate for drag racing, they are NOT appropriate for daily driver vehicles. Unless you are drag racing, rubber mounts are the appropriate choice for you daily driver truck. 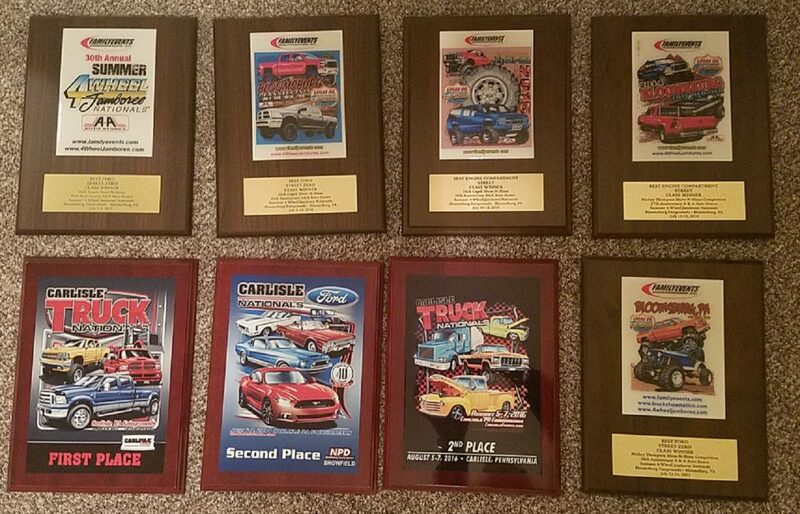 Todd and Lisa Rabert have been truck fanatics for a long time. 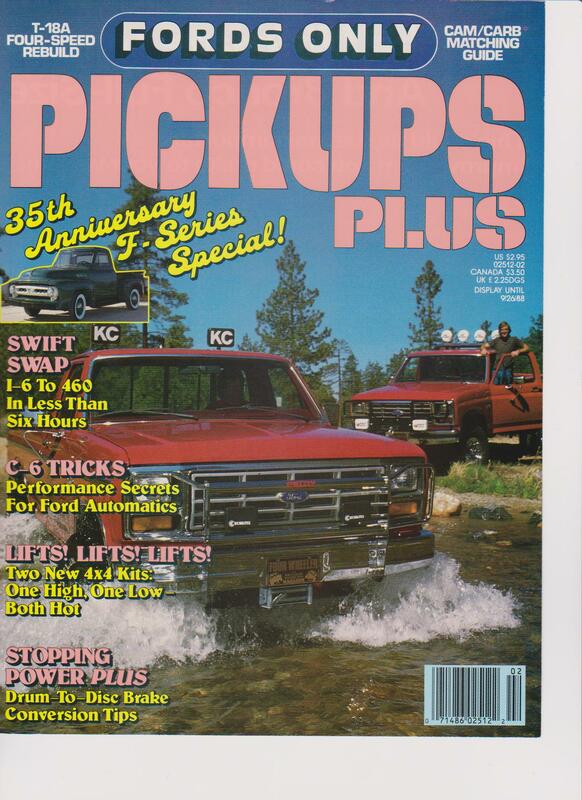 It all started in 1987 with Todd’s first truck, a Ford F-150. He knew absolutely nothing about making a tall vehicle, but wanted to get that thing up in the air. 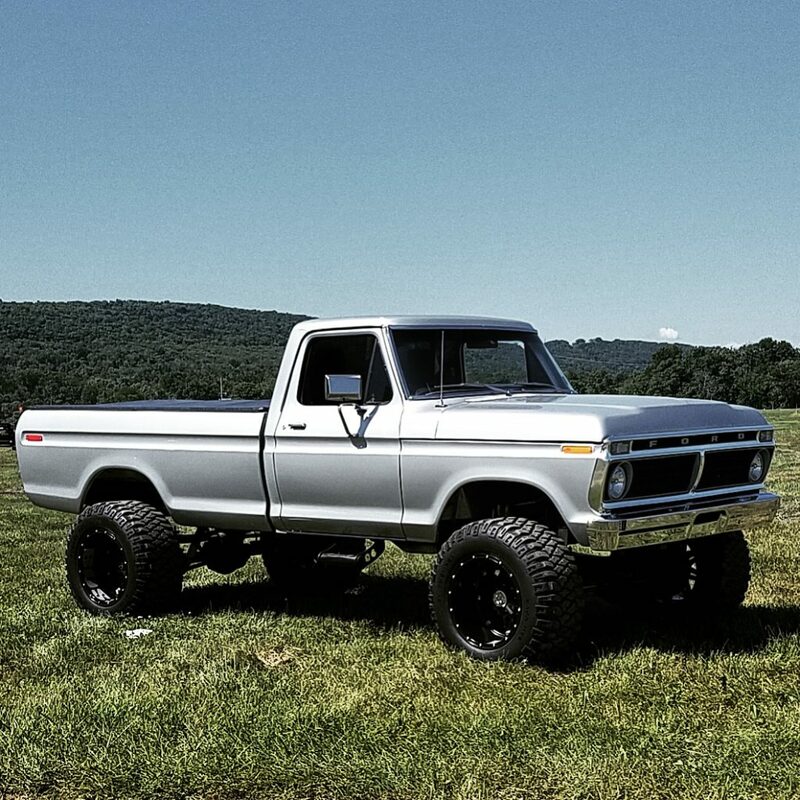 He started with a 3-inch body lift that let him run 31-inch Buckshot tires. 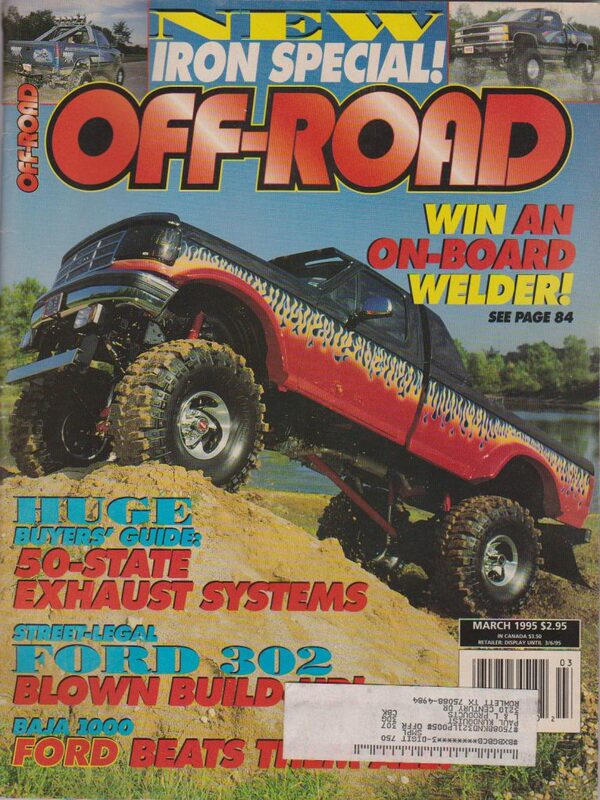 This didn’t last long-a 4-inch suspension lift allowed him to run 34-inch Swampers. This truck was beat to death romping in the hills with friends. It was replaced with a ’91 Ford F-250 that Todd swore he was going to leave alone. 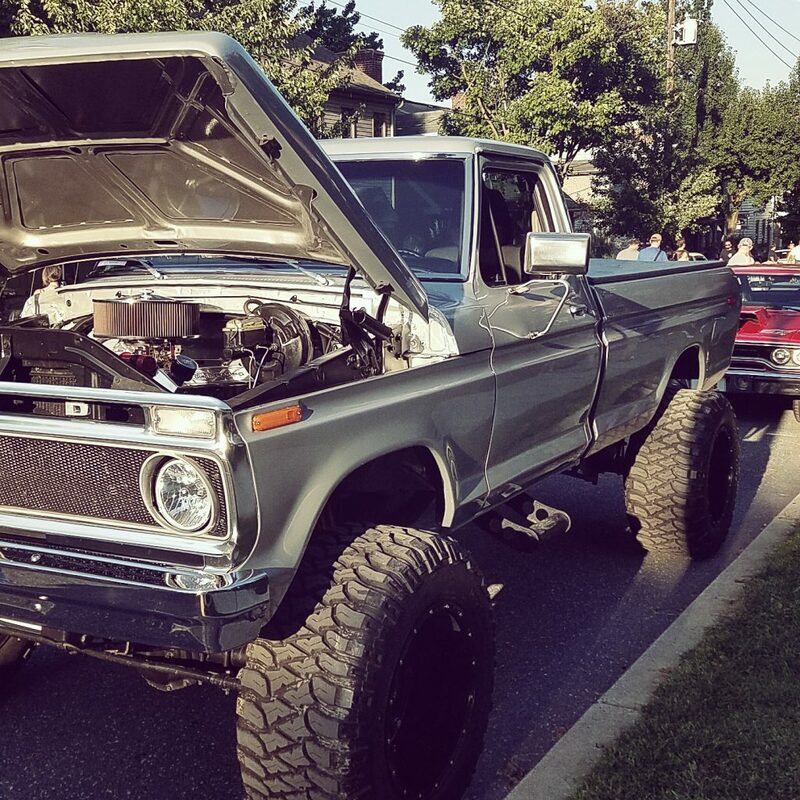 His promise turned to vapors when he went to a truck show in Bloomsburg. Once again, he started lifting, adding big tires, more lift, and so on. 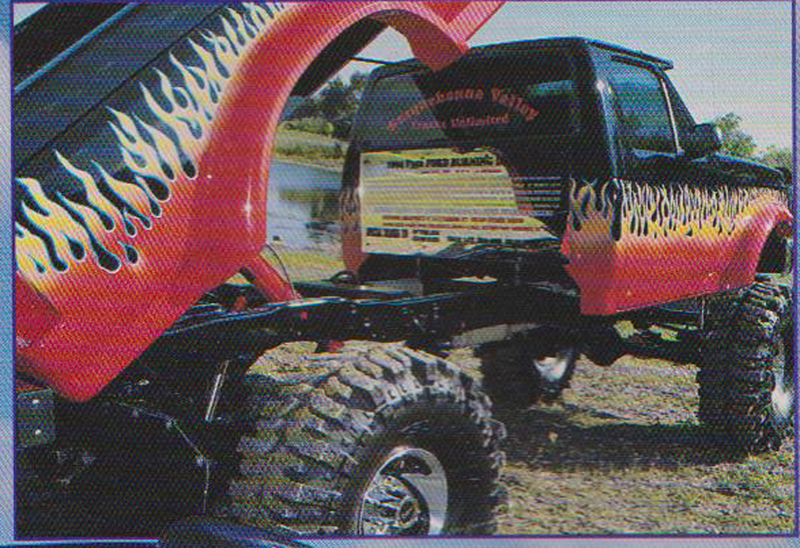 It ended up with a 6-suspension lift, 3-inch body lift, and 42-inch Super Swampers for traction. 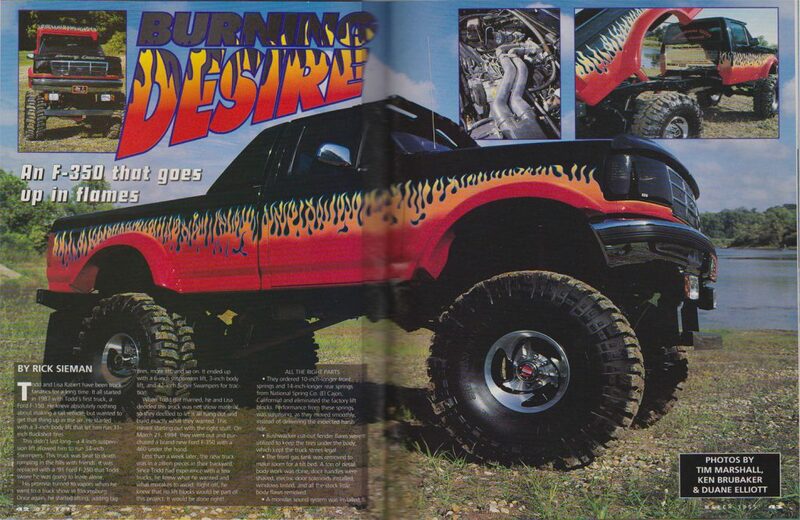 When Todd got married, he and Lisa decided this truck was not show material, so they decided to let it all hang out and build exactly what they wanted. This meant starting out with the right stuff: On March 21, 1994, they went out and purchased a brand-new Ford F-350 with a 460 under the hood. Less than a week later, the new truck was in a zillion pieces in their backyard. Since Todd had experience with a few trucks, he knew what he wanted and what mistakes to avoid. Right off, he knew that no lift blocks would be part of this project. It would be done right! Please check out our latest sponsor and Customer of the Month Nate! Contact us to be featured in our customer gallery! Click HERE to order the product featured in this article! In the search for more horsepower, the advice most often heard is, “There’s no substitute for cubic inches.” Generally that’s true, especially when the talk is focused on street-driven vehicles. There are superchargers, nitrous-oxide kits, radical camshafts, tunnel-ram manifolds and a shopping cart full of other modifications that can push a smaller engine’s horsepower curve higher, but there are also questions of practicality and price that have to be considered. 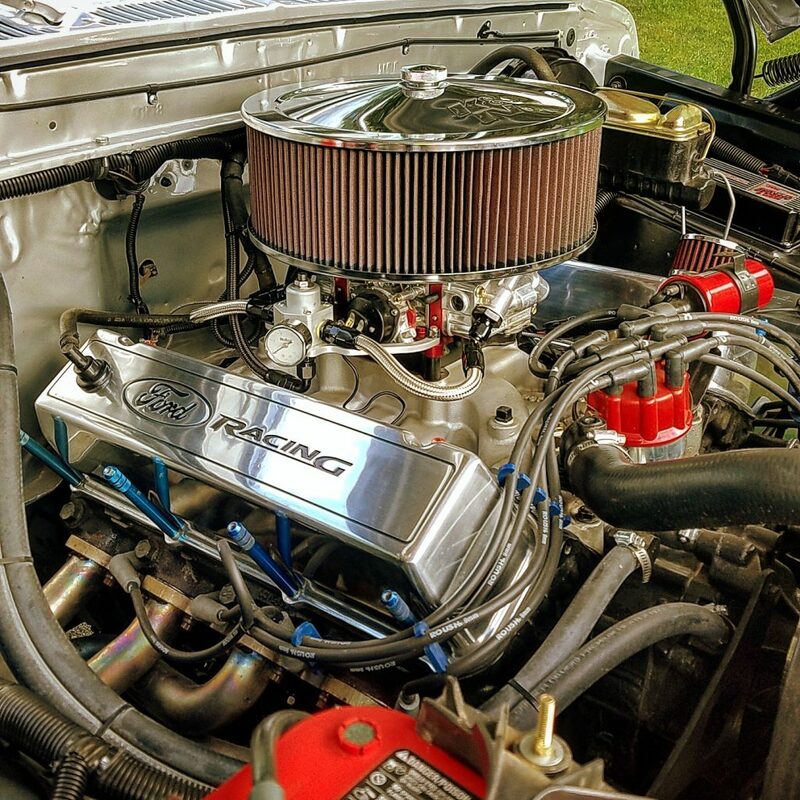 The most common method of getting those extra inches under the hood is to substitute the small engine with its big block counterpart. For full-size Ford Bronco owners, one of the easiest and most popular swaps is to drop in a 460 engine in place of the 302. 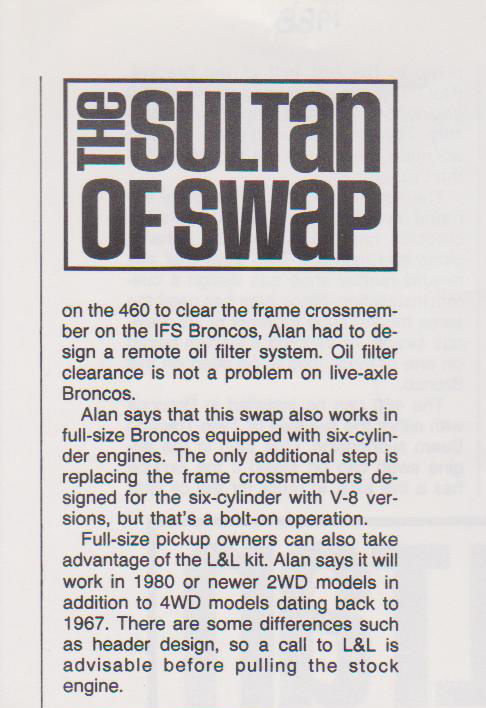 The switch is so simple that one day we test drove a stock 302-powered Bronco at 10:00 A.M., watched Alan make the change, and by 4:30 P.M. we were driving a 460-powered Bronco. 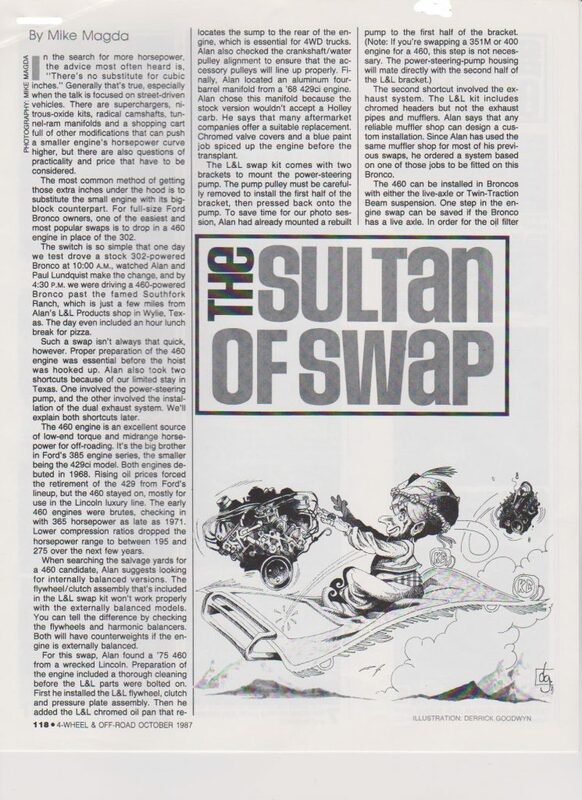 Such a swap isn’t always that quick, however. Proper preparation of the 460 engine was essential before the hoist was hooked up. The 460 engine is an excellent source of low-end torque and midrange horsepower for off-roading. 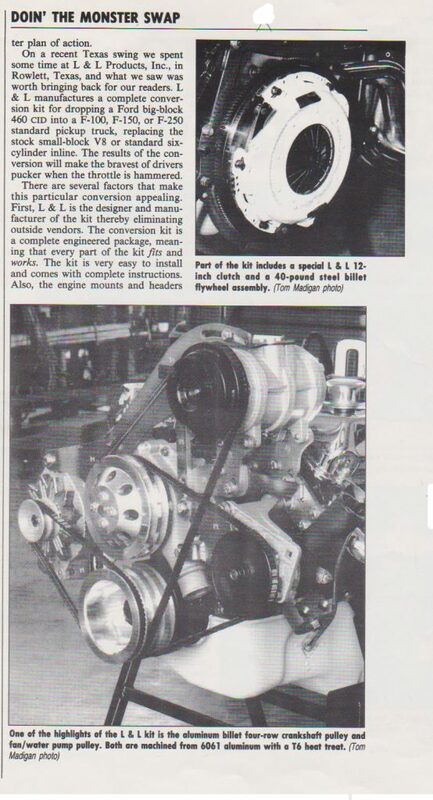 It’s the big brother in Ford’s 385 engine series, the smaller being the 429ci model. L&L 460 Complete Conversion kit featuring our signature heavy-duty 460 flywheel assembly. The best value for your money, our clutch and flywheel combo comes complete with our custom-designed heavy-duty billet flywheel , pressure plate and disc combo, bolts, pilot bearing, and alignment tool. 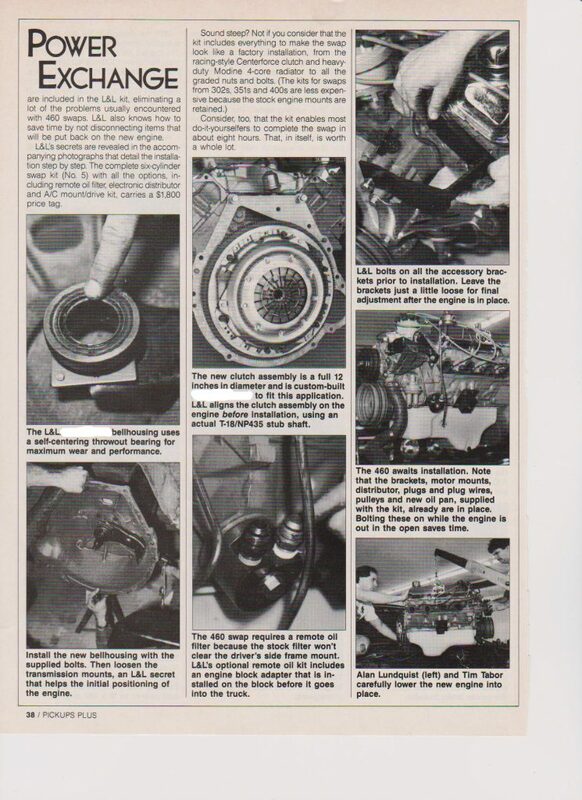 Click HERE to order the L&L Clutch Flywheel Assembly featured in this article! “How does L&L make this seemingly difficult swap so east? Simple. All needed parts are included in the L&L kit, eliminating a lot of the problems usually encountered with 460 swaps. L&L knows how to save time by not disconnecting items that will be put back on the new engine. 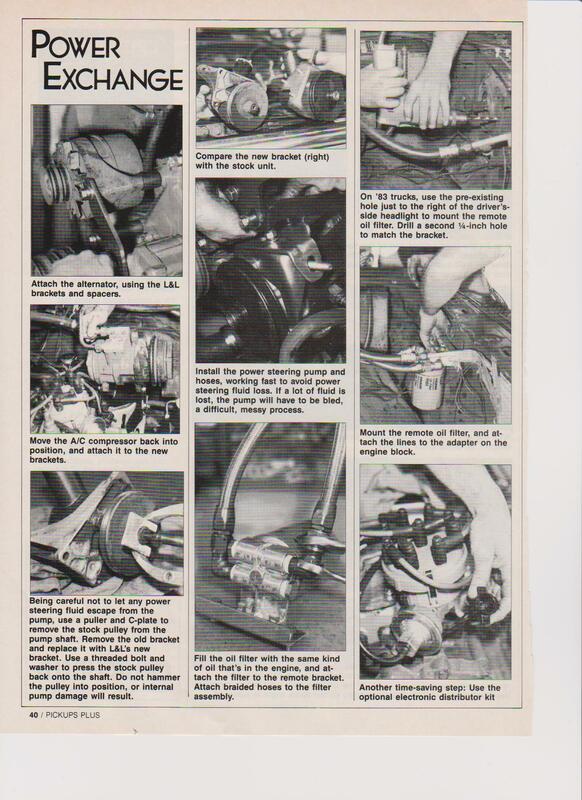 This Article was reproduced from Peterson’s 4-Wheel & Off Road site. 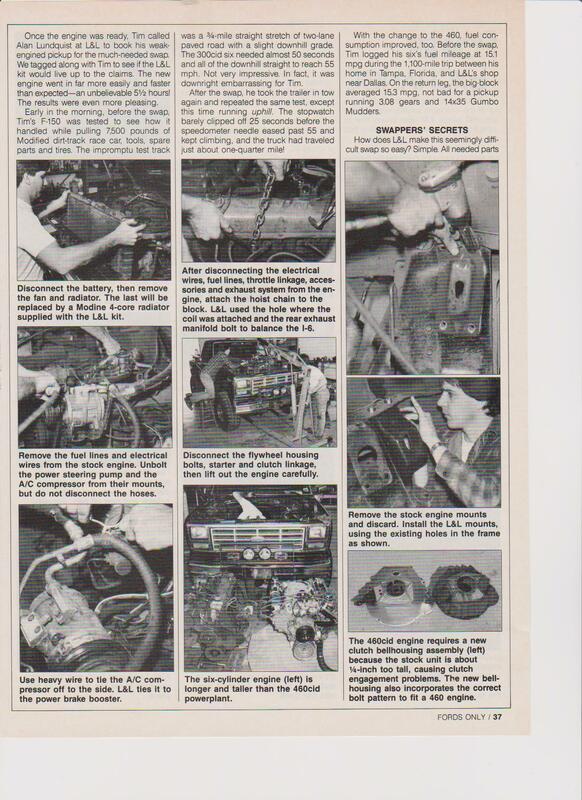 The original article can be found here @ 4wheelOffRoad.com. Some things in this world are just better if they’re bigger. Burgers and fries get super-sized. Lotteries hold no interest unless their jackpots are well into eight figures. Hot rodders know there’s no replacement for displacement, and the most popular supermodes have … well, every theory has to have some limits. L & L conversion Kit Massiveness can sometimes be unwieldy and difficult to live with. Aircraft carriers take 20 miles to burn a “U.” Too many super-size meals will cause you to do the same. And Anna Nicole Smith has…well, had way too much mention already. 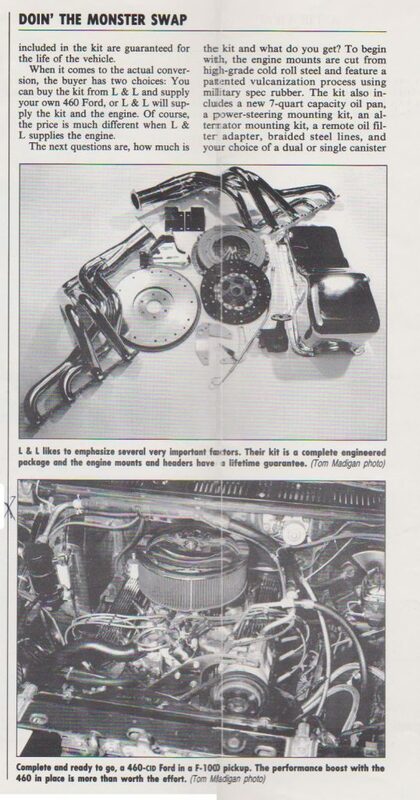 However, building a big-displacement engine by starting with a Ford 460 is easy. Stroker engines are all the rage these days. Big torque numbers, seemingly without a horsepower penalty, draw in enthusiasts like a free summer Springsteen concert in Jersey. Many times, though, stroker motors take special pains to assemble. Out-of-the-ordinary machining, clearancing, and fitting of custom parts is off-putting to most. 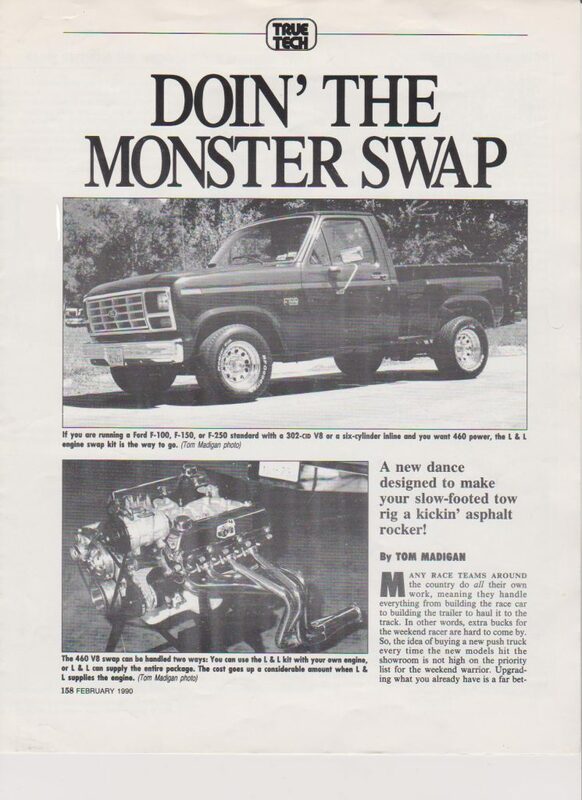 We wanted a stroker that didn’t require 10 trips to the machine shop and could be assembled by us engine neophytes at home where we’d be close to the brews. What follows is our plan in two parts. 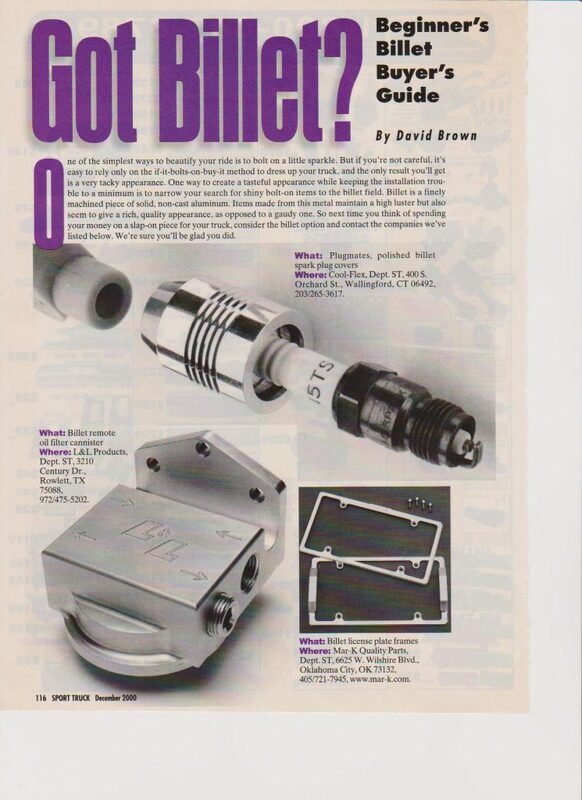 This month we’ll start with a stroked short-block with standard machining and assembly done by a reputable shop (Speed-O-Motive) and bolt on a great suite of aluminum speed parts (Edelbrock Performer RPM) to make the long-block. In part two, we’ll swap it all into our fullsize Bronco using quality, easy-to-find-and-get conversion pieces (L&L Products), and fire it up. By the way, L&L Products happens to be in Texas where folks’ll never let you forget that bigger is better. Please check out @ 4wheelOffRoad.com for the rest of this article.